The three Maitai hotels are managed by Hotel Management & Services (HMS), a division of the Pacific Beachcomber Group, which is the reference in Polynesian tourism. 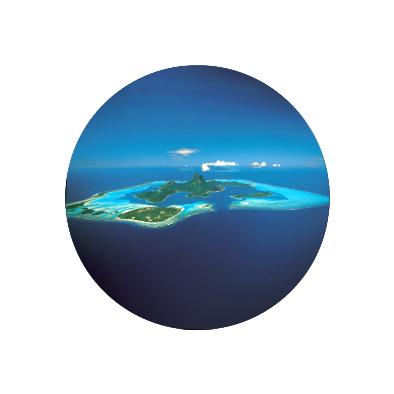 HMS is a Polynesian hotel management company, founded in 1996 at the time of the creation of the Maitai Polynesia hotel project on Bora Bora. The Maitai Hotels benefit from synergies with the Pacific Beachcomber Group (which also owns the InterContinental Resorts in French Polynesia, the luxury cruise ship Paul Gauguin based year-round in Polynesian waters, and is developing a unique project on Marlon Brando’s private island, Tetiaroa) and capital support by the industry leader in this sector. The Managing Director, Laurent Darcy, and the Director of Operations and Sales, Christophe Gomet, each possess a solid background and professional experience successfully managing and operating hotels in French Polynesia. Originally both from mainland France, they have lived and worked in French Polynesia for over twenty years. EarthCheck, your Maitai Hotels commit for the Environment ! French Polynesia is an environment rich in fauna, flora and culture that Maitai Hotels desire to preserve at all costs in order to keep this little corner of paradise intact. To do so, the Maitai Hotels, with the Maitai Polynesia Bora Bora in 2010, were the first to engage in the EarthCheck environmental and social control system, followed by the Maitai Rangiroa and finally the Maitai Lapita Huahine in 2013. EarthCheck is the environmental and social benchmarking system the most used in the Travel and Tourism industry. More than 1,300 organizations in 70 countries have chosen the EarthCheck program to improve their energy efficiency and reduce their environmental footprint. We daily operate to reduce our consumption of water, electricity but also our waste. In addition, many environmental activities are regularly conducted to educate and train staff in the EarthCheck program, sustainable development, and eco-sustainability. A special attention is given to the employment and empowerment of local people, and all the products and services involved in local environmental support. Each year, an environmental audit is performed to measure the environmental impact of our proudly certified properties.